On Tuesday the 26th of March, Kara and I had the opportunity to get on board the large, but spectacular, Majestic Princess. From the moment we started our check-in process, it was all done seemingly and effortless, with lots of courteous smiles and done so quickly we were on board within 10 minutes. It was a very nice way to start the cruise. Kara and I were cruising from Sydney up to Brisbane, which is a sector of the 19-night sailing from Sydney to Hong Kong – a perfect taster to experience Princess. 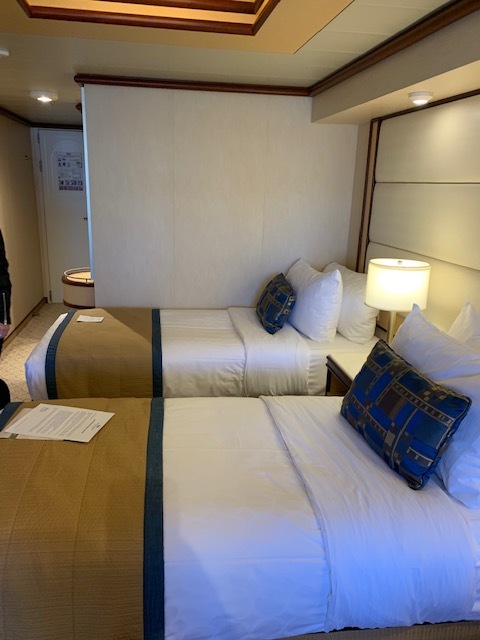 We made our way to our cabin, which was a mini-suite on deck 8. It was nice and had a lovely, spacious feel. The lounge looking out onto the balcony door was big enough to seat 4 full grown adults which we thought was great and gives it that extra feeling of comfort. The balcony was a good size and comfortable to sit out and enjoy the views. The bathroom I found bigger than usual, which is great when cruising! Please note, it was a shower over bath. Soon after our bags arrived, we freshened up and then went to explore and had a walk through the ship. We have to say, Majestic was beautiful and very elegant. This then followed with meeting our group for pre-dinner cocktails at the Adults only ‘Hollywood Conservatory’ located forward on Sun Deck 17. This is such a well-designed area of the ship. You first walk through the Indoor Hollywood Pool Club before reaching the Conservatory. It has an extremely relaxed vibe and had a large indoor chess set and many cabanas. This was the perfect lounge for prime viewing as you are sailing out of your destination. Following cocktail hour, the group went to Deck 7 to enjoy a nice three-course meal at the Crown Grill & Bar Restaurant located aft of the ship. All meals were delicious and well-presented by the very attentive dining room staff. 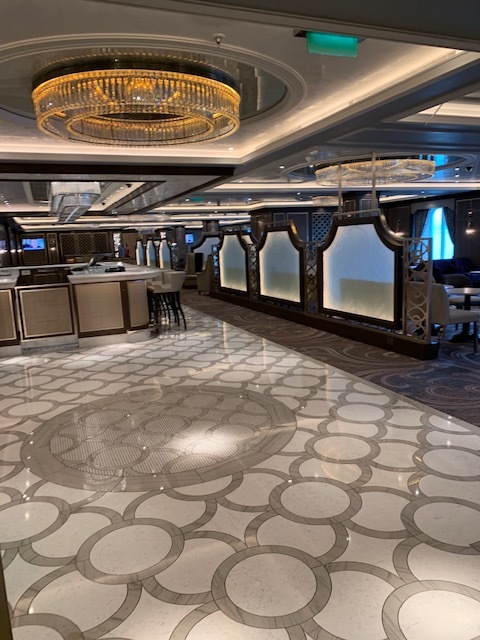 For the nightly entertainment, we headed to Crooners, the very modern piano bar, on deck 6. It is set out beautifully. 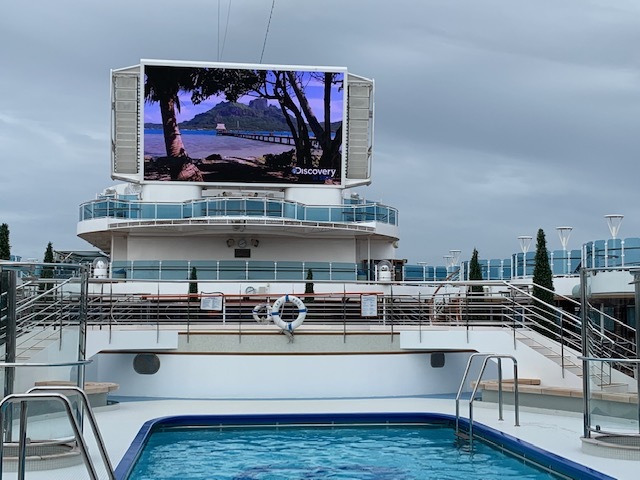 We found a lot of guests onboard like to come here to meet new people and relax with a drink in hand whilst enjoying the wonderful entertainer. The second day we had a group presentation session in the Princess Live venue followed by an in-depth ship tour with many of the Princess Representatives. 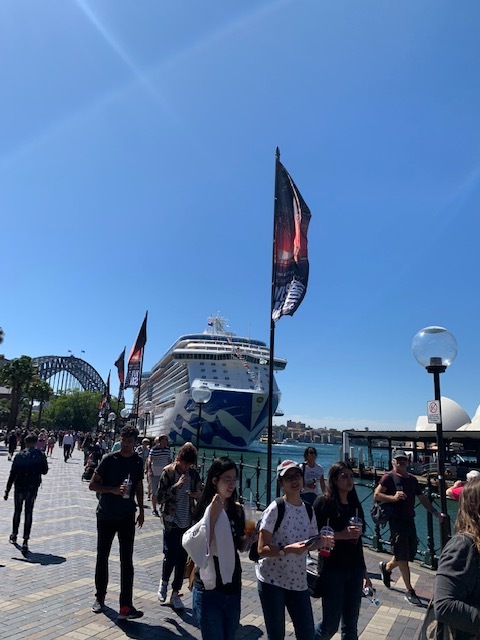 Following the tour, we were able to take advantage of as much of the ship’s entertainment and activities that we could fit in, and followed on with a lovely meal at the World Fresh Market place which had a lovely selection of different cuisines. Majestic Princess offers a wide range of entertainment to suit all ages and interests. This includes informative lectures on ports and destinations visited on each sailing, guest speakers, Bellagio style fountain show on the main pool deck, Broadway production shows, new and innovative technological shows and worldwide guest performers. 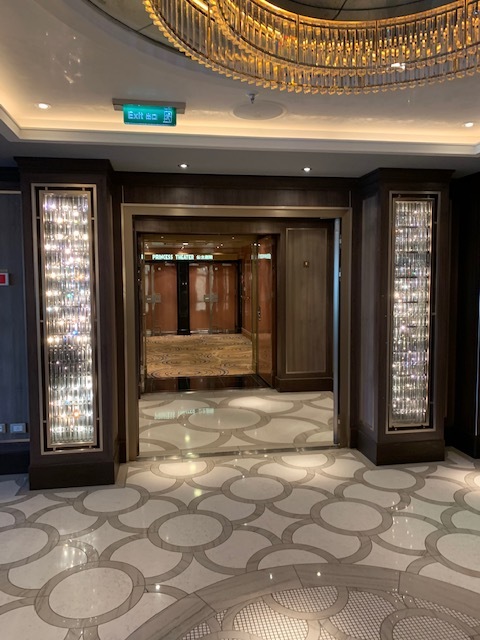 In addition, facilities such as an outdoor exercise circuit, Outdoor Movies, Golf Driving Range and Putting Green, full-size basketball court and Bullseye Laser Shooting Range all located over Deck 17 to 19. You really are spoilt for choice. The next morning, we arrived in Brisbane where we disembarked. Thank you to Princess for having us for a truly incredible experience.